We Admit It! We’ve hit the Committee stage once again. That means the end is so close but yet so far away. Committee is not for the faint of heart. It takes a lot of prep work, dedication and commitment (and Scooby snacks, but more on that later). Not all admission offices use Committee deliberations, but it’s a vital component of our review process. It allows us, all of us together, to really see the class take shape. Up until now we’ve been reading files individually. And yes, every file has been read by at least two if not more of us. And yes, when we gather at our every-other-week staff meetings we share some of the great applications we’ve read. But up until now, each of us has really only seen a piece of the puzzle. We’ve got a lot of admitting to do and Committee is where we do it. 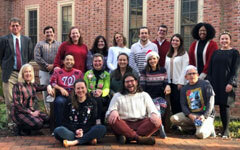 For the next three to four weeks we will gather all day, every day, in our windowless conference rooms, armed with our files, our wits and our desire to build the best and brightest class W&M has ever seen. Committee takes a lot of time, a lot of hard work, a lot of stamina and A LOT of sugar. So we don’t forge ahead empty handed (or on an empty stomach). 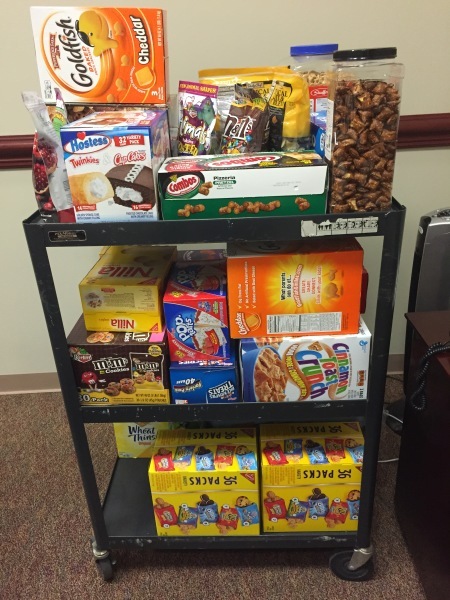 Our Committee snacks cart is prepared (and if you’re looking for healthy snacks in the photo, don’t bother – the closest we get to healthy is Nature Valley granola bars, trail mix and dried fruit). And that sugar, in part, will be what sustains us through Committee. Our camaraderie will sustain us also. But what will sustain us the most is you, our applicants. Your talents, your accomplishments, your stories. You are the future of William & Mary, and you impress and inspire us each and every day. So stay tuned for the ever-popular Overheard in Committee blog series in the coming weeks. In the meantime send us good thoughts and good vibes. But please do not send any more sugar. We’re not sure our arteries or our waistlines can take it. Does W&M require the college report provided on the Common App website? I’m applying as a fall 2015 transfer and was unable to find out. @W&M Hopeful, we don’t require it at time of application but we require it to enroll so if you’re able to submit it with your application it’s easiest and might save you a step later on. I have a quick question—when will the potential 1693 Scholars be notified for essay submission? @Excited To Be @W&M, yes, for the most part semi-finalists have been notified. Are ED Deferred students looked at during this process, or have they been already decided? @KB, are you asking if those who were deferred are reviewed during regular decision committee? Sorry for just seeing this! And yes, are deferred students reviewed during the rd committee? @KB, they certainly can be. Will deferred ED candidates that submit new information such as awards, leadership, and new test scores be reviewed? So close yet so far! My nerves get more strained every day! Are all applications reviewed through the committee? @Sebastian, no, not all applicants are reviewed through committee. We just don’t have time to review all 14,000+ applicants during our Committee deliberations. Branching off Sebastian’s question a little bit – how do you choose who you are going to review in committee? Are they chosen randomly or have they been predetermined? Thanks for taking the time to answer our questions despite having such a packed schedule! @Maggie, we as regional deans assess which cases are best suited to bring to committee. Some decisions are fairly clear after the two reads that each application receives. Plenty, however, are not as clear, and it’s these cases that we review in Committee. @KSB, all deferred applicants are reviewed again including any new info sent. If we believe a deferred student compares favorably to other applicants we are discussing in Committee we will discuss their application. Wonderful! My son has worked very hard to improve what he could on his application. Hi – when are deferred ED applicants expected to hear about a decision? @Parent, they will hear when we release decisions to Regular Decision applicants. How do you fairly differentiate which applicants go to committee and which ones do not? @Go Tribe, generally we bring to Committee the most competitive or compelling applicants. Just wanted to say thanks for all that you all are doing! I’m still so excited to be a part of the Tribe next year.